Getting in Shape & Staying in Shape! I hope everyone had a great week and that you have fun weekend plans to unwind 🙂 Tonight, I am looking forward to going out for sushi with my sister, Kiran, and my best friend, Alyssa! Sushi is one of my absolute favorite foods + I need some good girl talk! Do you ever have that feeling where you think you’re running super fast for a long distance only to realize you weren’t? Well..that’s how I felt on my run this morning! I set out for a jog around the neighborhood armed with my “Map My Run” app. The entire time I felt strong and kept thinking “This must be a 9:00 minute/mile pace!” I was surprised to learn from “Map My Run” that I only ran 2.5 miles at a 9:50 min/mile pace. Although I was surprised by my performance, I am trying to not let it get me down. I know that I felt great during my workout and that is all that matters! I returned from my run, but still wanted to add a bit more cardio to my workout. Thus, I put together a simple cardio circuit that left me huffing and puffing! 1 minute rest, then repeat 2-3 times. The rest of my day was spent with my friend, Alyssa! We headed on out to the mall in hopes to find some staple outfit choices. I bought a few basics from H& M, Victoria’s Secret, and Nordstrom, and Alyssa put an awesome pair of jeans on hold at Express. I was drooling over Nordstrom’s anniversary sale..especially over their workout gear + shoes. 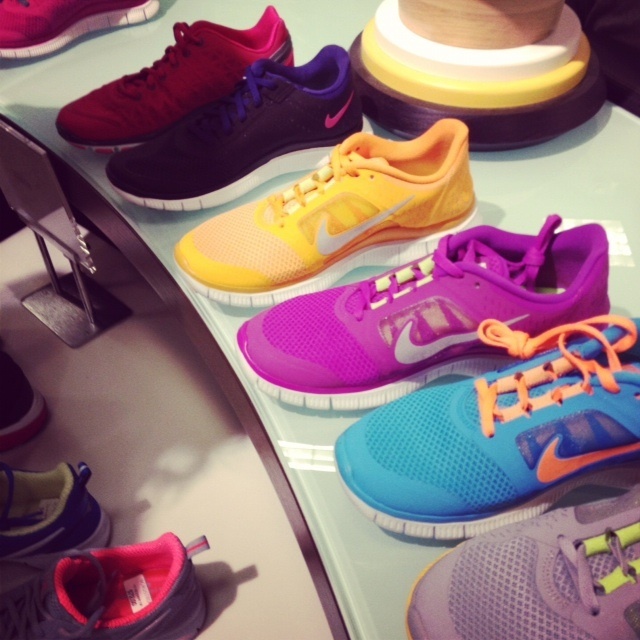 Can I have them all please? Tomorrow, I am looking forward to a long run early in the morning with my sis then I will be heading to the West Side Market for the very first time in years! I can’t wait to see all that this market has to offer. I hope you all have a safe and active weekend. Hi my name is Anjali and I am a 22 year old with a passion for fitness, good eats, and healthy living! Revival of the Fitness documents my journey through exercise, eating right (most of the time! ), and daily thoughts & musings. Although I blog about my fitness journey, I am not a fitness or nutrition expert. I'm just a gal who likes to talk fitness & food. All posts on my blog are solely my opinions and experiences. Always contact your physician before starting any new fitness or nutrition plans.